Experience a new found state of relaxation. We blend the most effective technologies with the world’s best skin care products to bring you an unparalleled experience of beautification, peace, and comfort. $230 | 75 min- Spa La Quinta’s citrus infusion of coconut oil, vitamin E, and mandarin oil combined with a blend of sugar, salt, and organic shea butter scrub. Rinse away any worries with the Vichy rain shower, followed by a warm, deep conditioning full body massage, leaving your body feeling revitalized and your skin as soft as cashmere. $230 | 75 min - Begin with a dry brush exfoliation to release dead, dry skin cells, and minimize the appearance of cellulite; then release yourself from all tension as you are massaged deeply with our blushing agave oil made with certified organic sunflower seed oil with hints of cherry and coconut milk. Hands and feet are painted with an organic golden honey glaze serum, then cocooned in a steaming towel wrap for intensive, deep hydration. $170 | 50 min - Draw upon the healing elements of ZENTS® organic shea butter body polish to invigorate and revitalize your skin. The scrub begins with a soothing application of vitamin E oil, followed by a hydrating shea butter polish. Sugar and salt particles gently return skin texture to its softest and smoothest state. Skin is then lavished with an application of organic shea butter and lotus lotion, followed by sunblock SPF 30 leaving skin silky smooth and protected from sun rays. $295 | 100 min - The most relaxing, hydrating, and luxurious of treatments. This service is tailored to you beginning with your very own personalized ZENTS aroma. Following an ultra-hydrating shea butter scrub; you are wrapped in a luscious cocoon, receiving a hot oil scalp treatment, before finishing with a relaxing full body Quench massage. 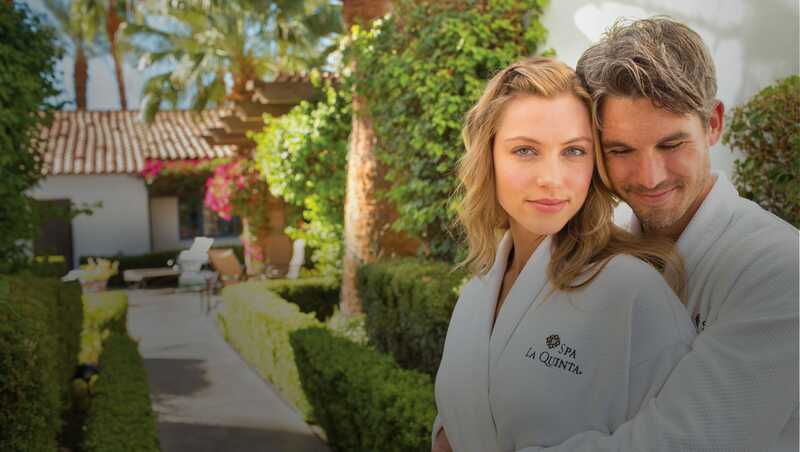 The La Quinta Luxe brings healing to every part of the body, with a personalized aroma healing imprint that awakens the deepest part of the mind. $325 | 120 min - Stress-reducing biodynamic flower essences detoxify the mind and body. Begin this mind-body cleanse ritual by soaking in our zen blend and truffle-infused bath while you sip a healing tonic. Dry brushing techniques are then used to engage the lymphatic system and calm the mind, followed by a hydrating custom massage. Your ritual will close with a self-guided pranayama breathing journey, allowing you to achieve deep serenity. $170 - 50 min | 80 min - Designed for you, this massage is customized to your preferences with varying techniques and pressures ranging from light to deep tissue. $185 - 50 min | $245 - 80 min - To enhance your performance or minimize recovery time, this invigorating massage is tailored to your specific physical and athletic goals. $235 | 80 min - A combination of rhythmic muscle compression and stretching to promote increased flexibility, range of motion, and relief of joint and muscle tension. Creates a relaxed and balanced mind and body. Performed over loose-fitting clothing. $235 | 80 min - Experience the healing properties of smooth, warmed basalt stones integrated with relaxing Swedish massage techniques. $235 | 80 min - This Hawaiian tradition, also known as “loving hands,” utilizes massage techniques with continuous, flowing strokes that move gently, yet deeply, into the muscles, enabling you to relax, give in and simply be. $245 | 80 min - Relax your entire body, mind, and spirit while you experience this full body Himalayan salt stone massage. Feel stress, tension, and toxins melt away. Himalayan salt promotes healthy blood sugar, improves digestion, and supports a healthy respiratory system and sinuses. $380 - 50 min | $490 - 80 min - Indulge yourself with a customized side-by-side massage in the privacy of our secluded couple’s suite. $160 | 50 min - Great for muscle aches, stress relief, and relaxation, this full body massage is tailored for our guests ages 10-15. $100 | 25 min - Pressure applied to foot reflex points stimulates and opens energy pathways, releasing tension and promoting rejuvenation. 50 min | Our seasonal vino therapy offers a luxurious wine-inspired treatment perfect for winding down. Begin your sensory journey with a flight of wine, followed by a 50-minute massage that incorporates Zents® therapeutic grade essential oils that match the wine's unique aromatics for a completely tailored spa experience. After the service, you will receive a full pour of your favorite wine to enjoy in our sage room or tranquility garden. 50 min - $170 | 80 min - $230 - Indulge yourself during this soothing journey with our zen blend-infused prenatal massage. $230 | 75 min - Relax and let us unveil your radiant glow as we exfoliate your skin with our organic UNZENTED shea butter-infused body polish, followed by a zen blend infused prenatal massage. $75 | 60 min - A deeply nourishing shea butter manicure that promotes healthy nails and hands. Offered in your chosen ZENTS® aromas, this ultra-hydrating and relaxing service begins with a soak using organic shea butter and fruit extract wash, followed by a smoothing and hydrating organic shea butter scrub. Relax as hands are massaged with organic shea butter and vitamin E cashmere oil, followed with a paintedon firming and moisturizing mask. This luxe experience culminates with warm paraffin to seal in the moisture. $100 | 75 min - A deeply nourishing shea butter pedicure that promotes healthy nails and feet. Choose a ZENTS® aroma and enjoy this ultra-hydrating experience that begins with a soothing soak using arnica and organic shea butter infused Epsom salt bath truffle, followed by a smoothing and hydrating organic shea butter scrub. Relax as feet are massaged with organic shea butter and vitamin E cashmere oil, followed with a painted-on firming and moisturizing mask. This luxe experience culminates with warm paraffin to seal in the moisture. $65 | 45 min - A soothing soak, along with an exfoliating sugar crystal scrub and a moisturizing massage, leave your skin deeply nourished and hydrated. Finish with a polish application of your choice. $80 | 60 min - A soothing soak, along with an exfoliating sugar crystal scrub and a moisturizing massage, leave your skin deeply nourished and hydrated. Finish with a polish application of your choice. $40 | 25 min - Express services include: trim, file, shape, cuticle care, and buff. Finish with a polish application of your choice. $60 | 35 min - Express services include: trim, file, shape, cuticle care, and buff. Finish with a polish application of your choice. $170 | 50 min - Renew your mind and body with an invigorating customizable massage to increase circulation and sooth sore muscles. This treatment includes a complimentary uplifting Mandarin ZENTS aromatherapy. $170 | 50 min - Experience a luxurious skincare treatment including a deep cleanse, exfoliation, steam and extraction. Your skin will be left radiant and glowing from a personalized mask customized to your individual needs. Includes a complimentary rose quartz eye treatment. $160 | 45 min - Stimulate your senses and revitalize your skin with the uplifting Mandarin infusion of coconut oil, vitamin E, sugar, salt and organic shea butter used to gently exfoliate as our Vichy shower provides a water massage to help circulate recently absorbed products while reducing toxins and waste. This treatment is concluded with a moisturizing lotion application leaving your skin good to glow. $135 | 105 min - Spring forward in high style with our spa manicure and pedicure and enliven your senses in the uplifting mandarin aroma. Treatment includes a foot soak, exfoliating sugar scrub, moisturizing lotion application concluded with nail shaping and a polish application of your choice.